Give to the Max for the Animals! 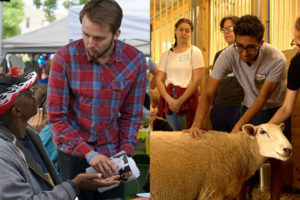 Nathan Gaut, left, volunteers with CAA pay-per-view outreach, and Yash Patel, right, participates in a CAA student tour of Spring Farm Sanctuary. Make a gift to CAA through GiveMN and support the students who are speaking out for the animals. What makes an animal advocate? How can CAA best support people in their process? This is one of the questions we asked ourselves in creating our new strategic plan. Advocates grow our movement by increasing awareness of animal suffering and building a welcoming community. The community supports people in moving toward a plant-based diet and developing effective advocacy skills. CAA is systematically building more advocates through training, information sessions, and community building. Few things demonstrate that as strongly as the growth of our University of Minnesota student group. Yash and Nathan are two of its leaders. Yash and Nathan have been involved with the group for several years and have become skilled advocates. Along with my support and guidance, they’ve helped to lead the group from having an average of ten students attending each meeting last school year to twenty students at each meeting this fall. With your help, we can start a student group at another Twin Cities school in the coming year and give current students advanced training from movement leaders at the Animal Rights National Conference in the summer of 2018. To make this a reality, we need to raise the first $8,000 of our $24,000 year-end goal through the GiveMN platform. This also gives us the chance to receive an extra $500 from GiveMN. You can maximize our chances of winning this extra $500 when you make your year-end gift on Saturday, November 4. Plus, all donations will be matched dollar for dollar. Please support the next generation of animal advocates and give generously.